Snaring is considered one of the most time and energy efficient ways a survivor can harvest wild game. It is so efficient that it is not legal in many places and should be considered a survival only activity, not a sport. I have been studying and surviving in the woods for years. I developed a system that works for me. It is base on proven methods. I have read a pile of survival manuals and one thing I have found out over and over again is many myths and unproven technique are past on from author to author. I have trained many students who at first don't understand my way of using real equipment such as professional grade self locking snares but once they see the benefit of using them will not leave home without them now. The biggest thing I have to overcome with most survival students is what I call the rabbit/squirrel syndrome. 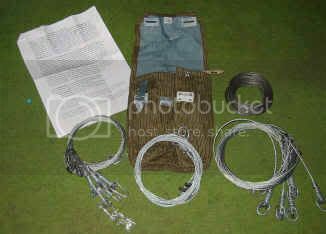 Most survival manuals deal with the snare wire of 22-28 ga wire. Why because the author doesn't know about real snares. Will the snare wire work for rabbits and squirrel sure it will I am not saying it won't but let us deal with a little reality. You will starve to death if all you eat is rabbits and squirrels. The meat is too lean. You need fat to survive in the wild. You can't survive on wild greens either because your body needs B-12. The only way to get B-12 in the wild is through meat. Starve to death means over 30 days so don't e-mail me with "I spend a weekend surviving on just wild greens". When survival students first see my snares they say these are huge, Why? Simple I come from a trapping background and the first rule to a becoming a good trapper is have the best equipment to hold the animal until you return. Simple concept but very hard to get across to the general survival student. In order for you to survive in the wilds you need meat and fat. What animal (s) is going to give you this? Raccoon and beaver. Now in order to hold these two animals until you return you need real snares. Why? because these animals are tough, strong and independent they will roll bite, fight and twist to escape. They will go through snare wire of 22-28 ga wire like a knife through hot butter. Here is a modern professional grade self locking snare. This is one way to make a snare. We use a snare that comes with a support collar that hooks into the support wire. The deer stop is place so the loop only closes to 2 1/2 inches. If a deer steps in the snare it well not tighten all the way on the foot so the animal can escape. But if a raccoon, beaver or other target animals enters the snare it well tighten enough to hold the animal until you return. In our Emergency snare kits have 6 small game snares, 6 medium game and 2 emergency only cam locks for deer snares. So let us look at this: for 30 days do you want to be running around trying to catch 80-90 squirrels and rabbits or have a snare kit with a proven system that will allow you to catch 2 deer, 6 raccoon or beavers and 10 rabbits and squirrels. 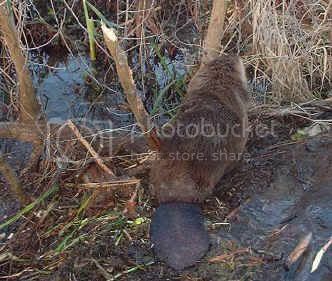 Here is some pictures of animal caught in snares. Thanks to Beavertrapper1. You need real snares to hold an animal this size. 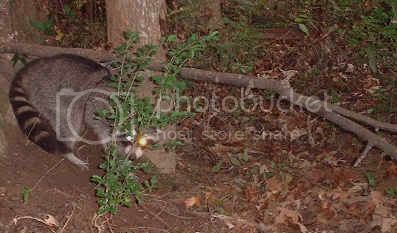 Here is a picture of a snared raccoon. Thanks to Beavertrapper1. Notice the animals are still alive. This is because the snare used are relaxing lock that only restrain the animals. You put the animal down with a quick shot from a .22 to the head. The camlock is design to kill the animal and does not back off. This article was written by Buckshot author of Buckshot's Modern Trapping Guide. If you go over to his web site you can sign up for a free monthly newsletter.